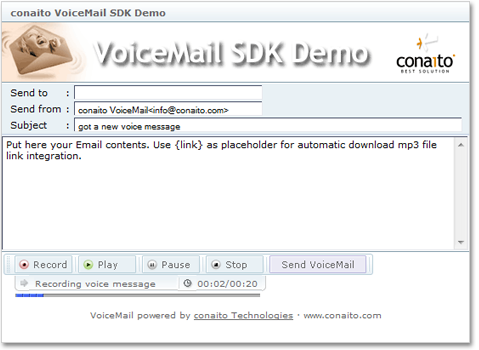 The Conaito VoiceMail SDK is designed for web developers and allows to record and send voice messages from web sites to any existing e-mail client software, even to free web based e-mail like Googlemail, Hotmail and Yahoo. The recipient receives the usual e-mail message with link to Mp3 audio file. Recipients can listen the Mp3 file by any existing Mp3 player. Mp3 players are installed almost on the each computer, so, no problem with playback! Also, it is possible to save recorded audio file on the client computer and open it from there. To playback the recorded Mp3 audio from the server the recording applet works in the streaming mode. The VoiceMail SDK uses native methods to sound capture, LAME Mp3 encoding/ decoding and playback in the DLL, which will be installed on the computer when user uses the applet for the first time. The recording applet is already digitally signed. The Conaito VoiceMail recording is compatible with Windows, MacOS X and with Microsoft Internet Explorer 4.0 and up, Netscape 7, FireFox, Mozilla, Opera browsers. On the Mac with Safari and Opera. The idea of voice mail is very simple. Web voice mail application creates the text and voice messages and send them to web server via HTTP by POST method. On the server side the server scripts create usual e-mail message body with text message and with link to Mp3 file (voice message). Mp3 file is stored on the server. Server script passes the e-mail message body to Mail Transfer Agent, which send it to recepient. Recepient receives the e-mail message with text and link to Mp3 file and downloads and/or play Mp3 file. Audio is captured from sound card. The sampling frequencies are 8000Hz, 11025Hz, 16000Hz, 22050Hz, 24000Hz, 32000Hz, 44100Hz and 48000hz. Playback of the recorded Mp3 file for sound quality and content evaluation. Uploading of Mp3 file to web server via HTTP. The server scripts (PHP, ASP or ASP.NET) is used to receive Mp3 file on the server. Also, it is possible to save/open/delete audio file on the client computer. Send VoiceMail with Link to the recorded Mp3 voice message. Also, is it possible to playback of the Mp3 files from the web server in the streaming mode. We hope you enjoy the Conaito VoiceMail SDK – The powerful solution for recording and sending voice messages from your websites. Your company is truly upstanding and is behind its product 100%. It really saves me time and effort. I was amazed at the quality of your product VoiceMail SDK.